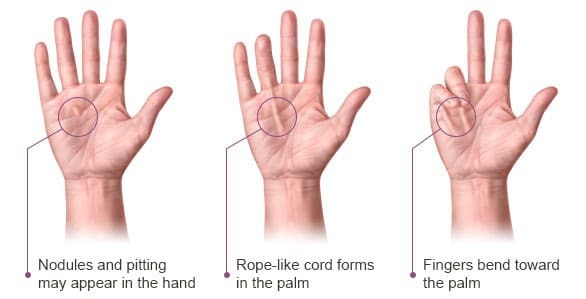 Dupuytren’s contracture is a painless thickening and tightening (contracture) of tissue beneath the skin on the palm of the hand and fingers, pulling one or more fingers to a curled up position. Symptoms occur gradually, over years, and increase with age. In some cases, it progresses in weeks or months; while for others it may pauses, then progress. One or both hands may be affected. Most commonly affects the ring and little fingers. Nodules – small, tender but painless lump/s form in the tissue under the skin on the palm of the hand. Bands of Tissue – These lumps (nodules) may thicken and contract over time, forming tough cord-like bands under the skin. Flexed fingers – one or more fingers curl toward the palm. It becomes difficult to extend the fingers. In severe cases, it becomes impossible to straighten them. Shaking hands or putting your hand in your pocket might become difficult as the condition progresses. Although there is no way to stop developing Dupuytren’s contractures, and although symptoms are likely to recur, there are a number of effective treatments, both non-surgical and surgical. Exercise and stretch your fingers. Gentle stretching and bending your fingers backward from your palm may help slow down the disease. Splints –may be useful, but they do not prevent increased contractures. Splinting the flexed fingers should also not be forceful as it may speed the progression of the condition. Warm water bath or heat packs are good before stretching. Injection of Corticosteroid – a powerful anti-inflammatory medication may help relieve the pain, if the lumps are at all painful. It may prevent the progression of contracture for some. Several injections may be needed for a lasting effect but should be done with caution as it may rupture the tendon. Surgical treatment may be done to release the contracture, remove thickened bands, and restore normal finger movements, followed by physical therapy and exercises for the hand. Surgery should be discussed thoroughly with your physician as this may cause complications during and/or after the procedure. Less-Invasive Treatments: Needle Aponeurotomy – this approach is done by inserting a needle to puncture and break apart the cord of tissue causing the contracture. This may be repeated if the contractures recur. However, this cannot be done in some areas of your finger as it could damage a tendon or a nerve. Dupuytren’s contracture progresses at an unpredictable rate, and there is no way to stop or cure this condition. And even if the chance of recurrence is there, treatments are available and finger movements are mostly improved. No primary prevention studies exist, and it remains to be seen whether management of diabetes or reduction in smoking and alcohol will reduce the prevalence of the disease. As occupational trauma is thought to be associated with Dupuytren's disease, proper protection of the hand from trauma at work is indicated.